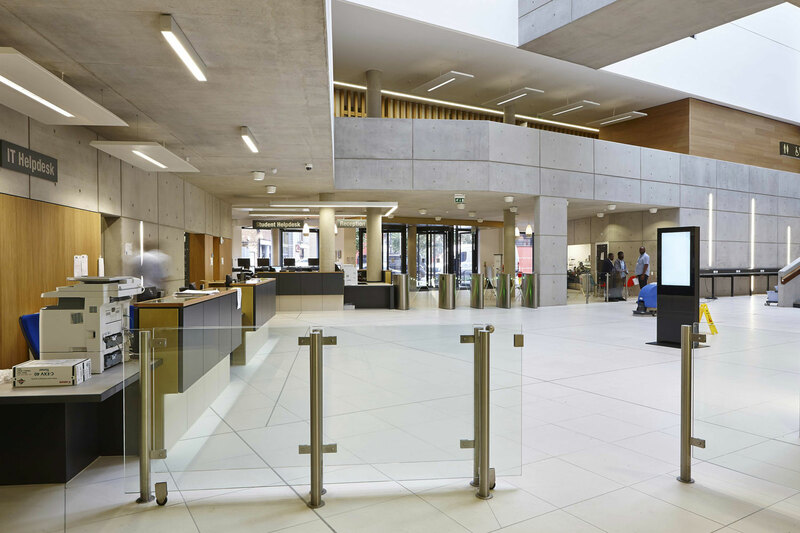 University Square Stratford by Make Architects is the new teaching block for the University of East London and is a joint venture between UEL and Birkbeck, University of London at the heart of Stratford’s cultural district that opened in 2013 costing £33 million. 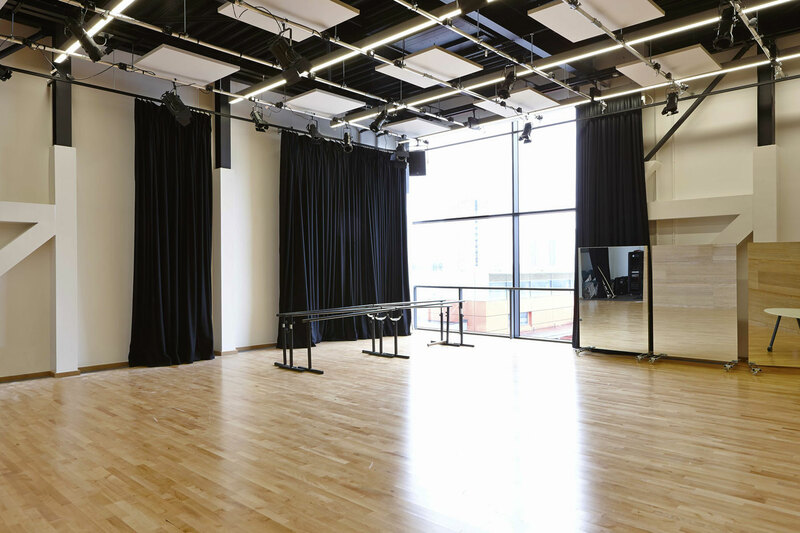 The building houses teaching, offices, performance spaces and a central atrium spread over five floors and an area of 8.600 square metres. 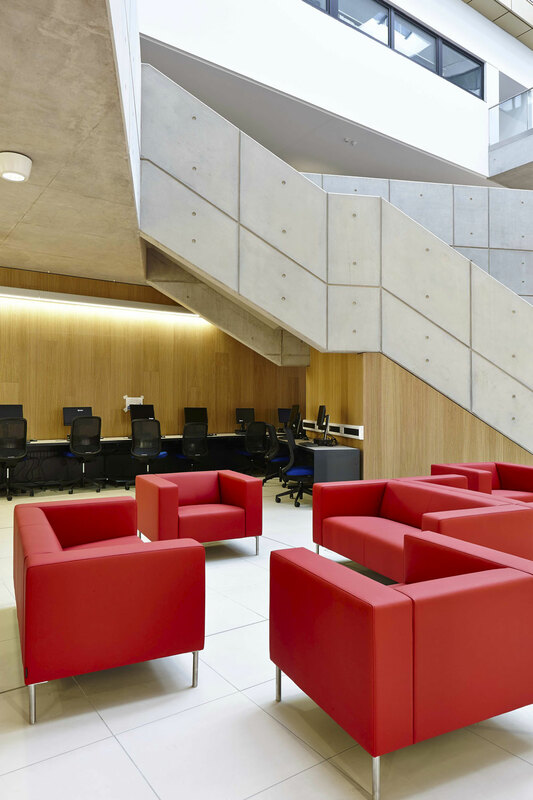 The building was created for UEL students to use during the day and Birkbeck’s night classes. 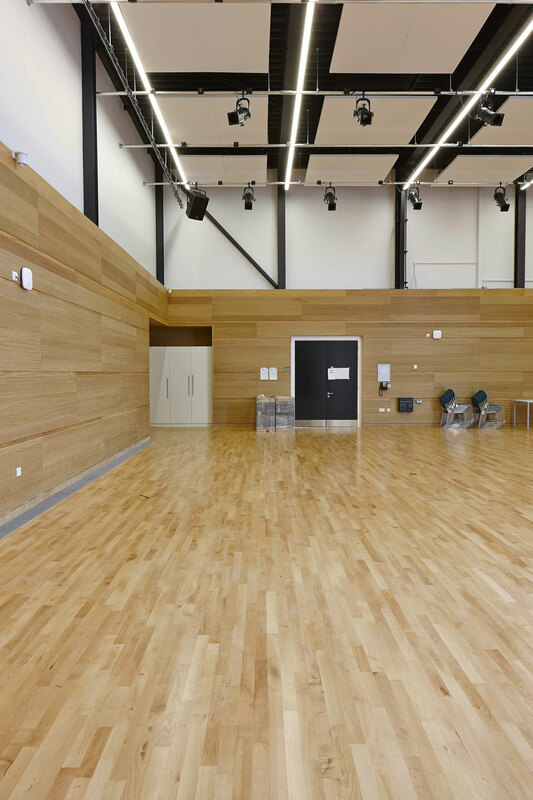 A shared facility was believed to be constructive not only because of the operating hours. 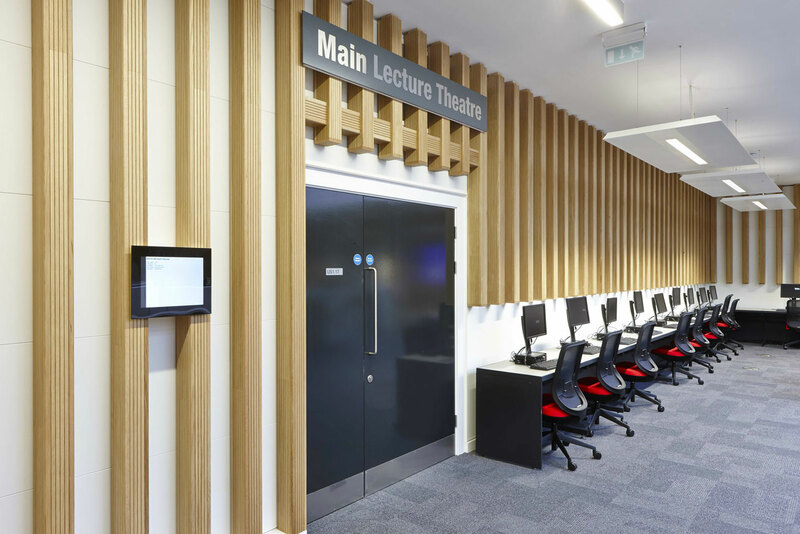 The academic cross-fertilisation benefits between departments and subjects have also been acknowledged. 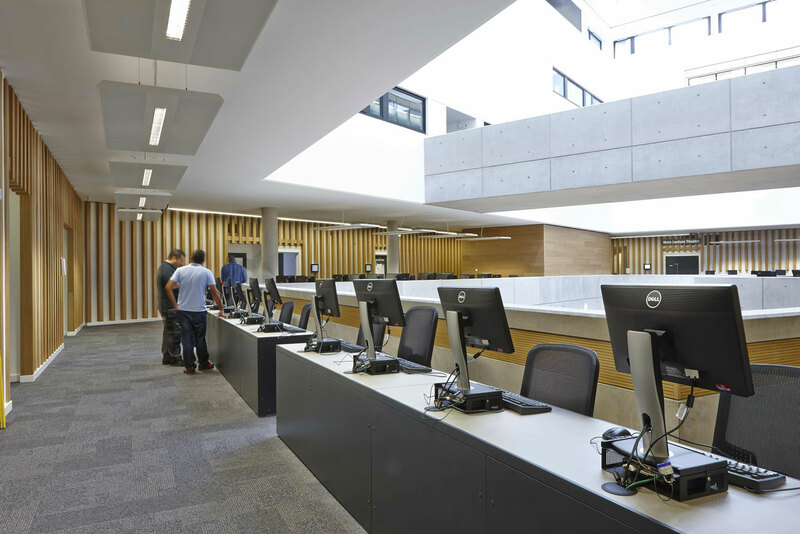 The unique joint venture between Birkbeck University of London and University of East London has created a major new campus in central Stratford for 3,400 students. 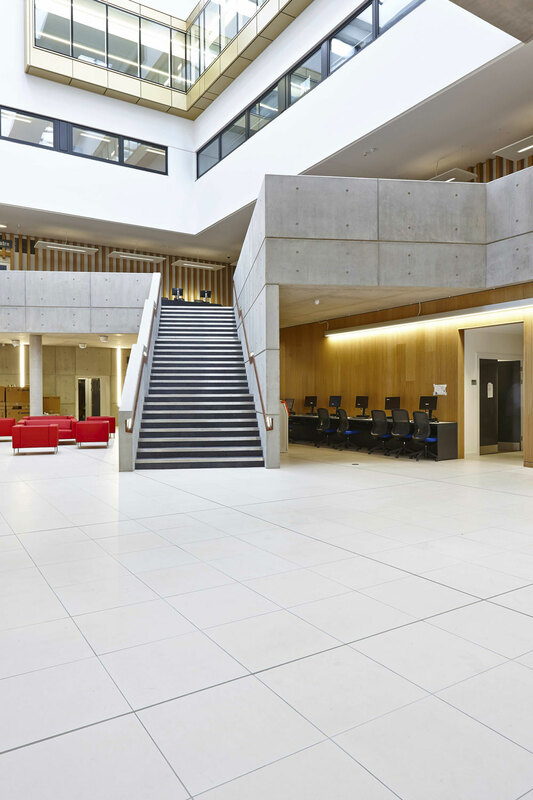 The building is sustainable, accessible and has won a BREEAM Excellent rating. 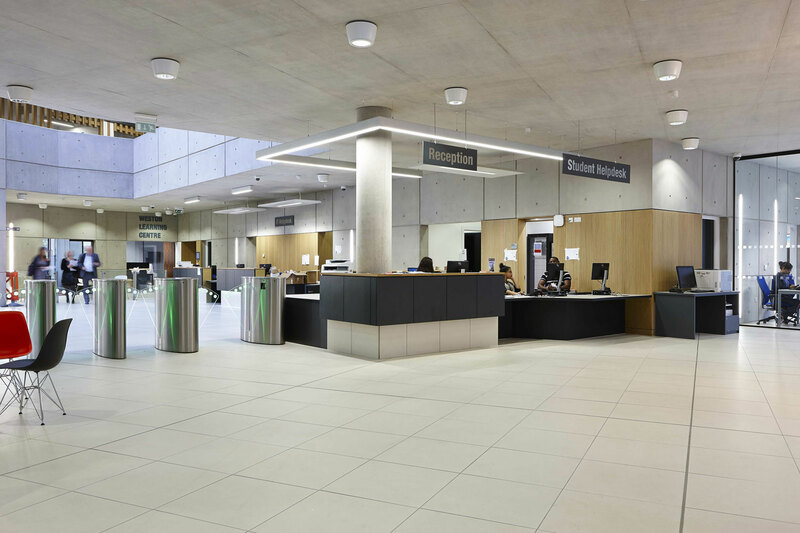 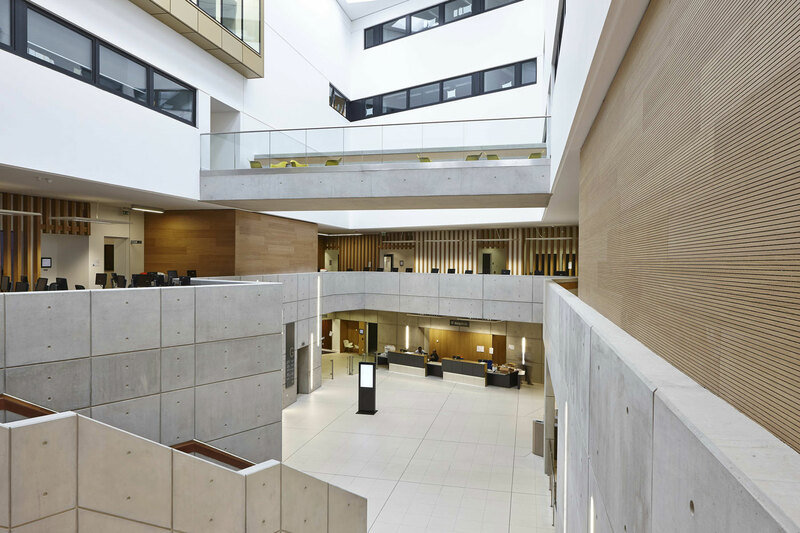 The raw concrete interior finish has required the installation of sophisticated acoustic control materials to control sound reverberation within the five floor open atrium and other areas. 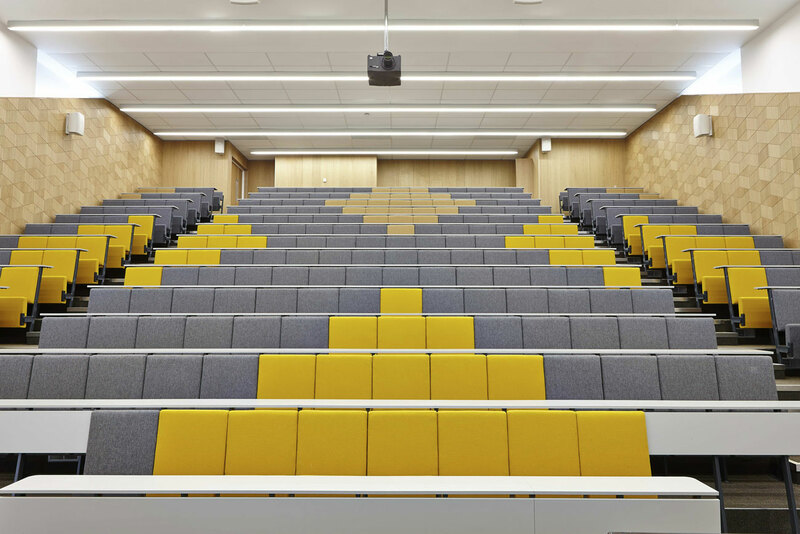 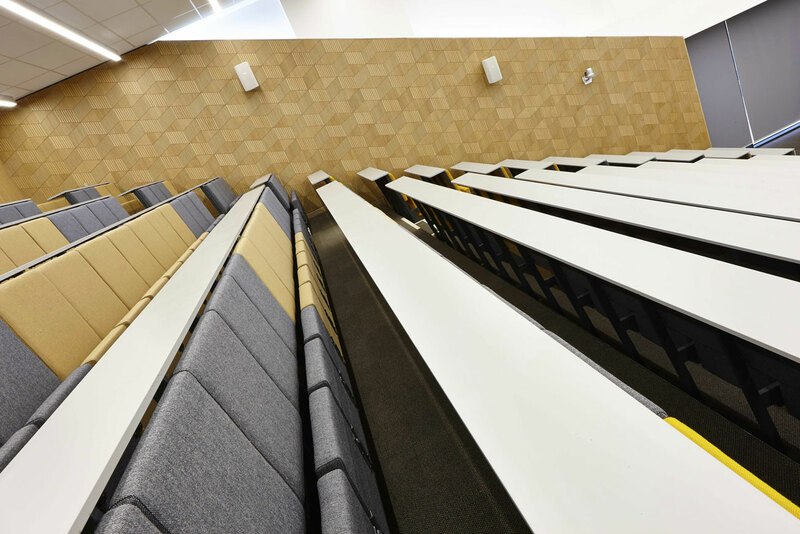 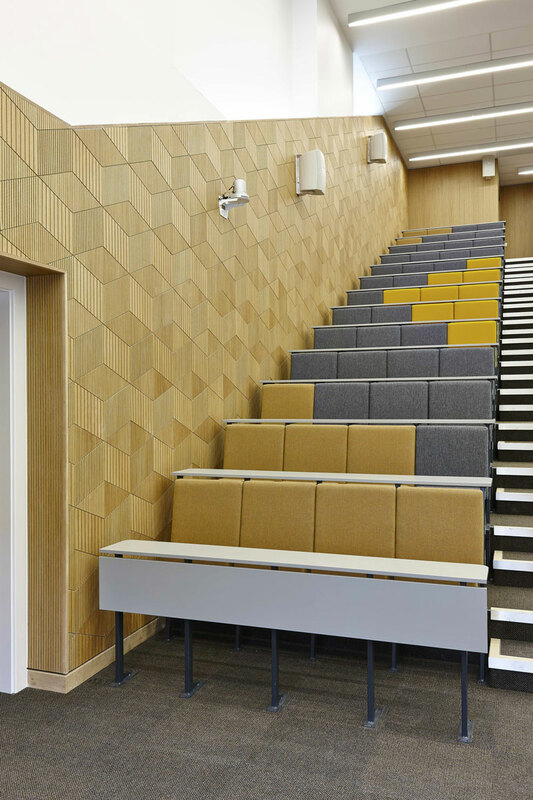 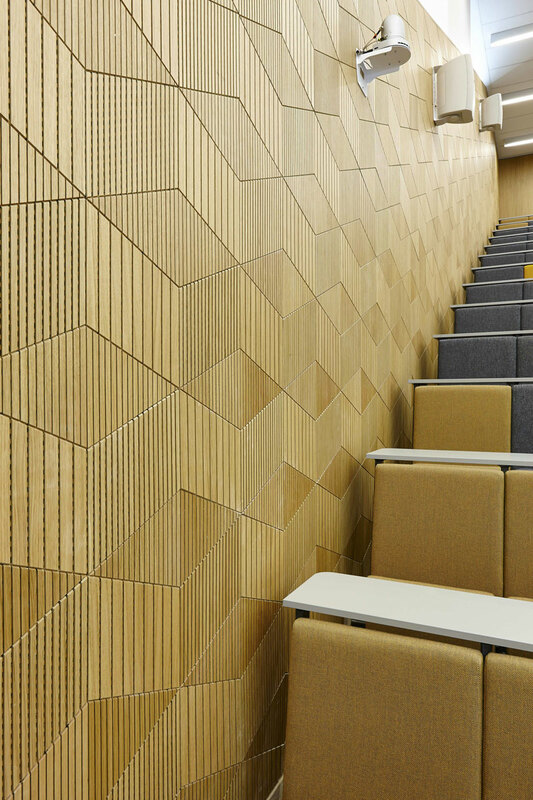 Perforated wood acoustic panels were installed on vertical surfaces in the atrium, elevated walkways and within the lecture theatre. 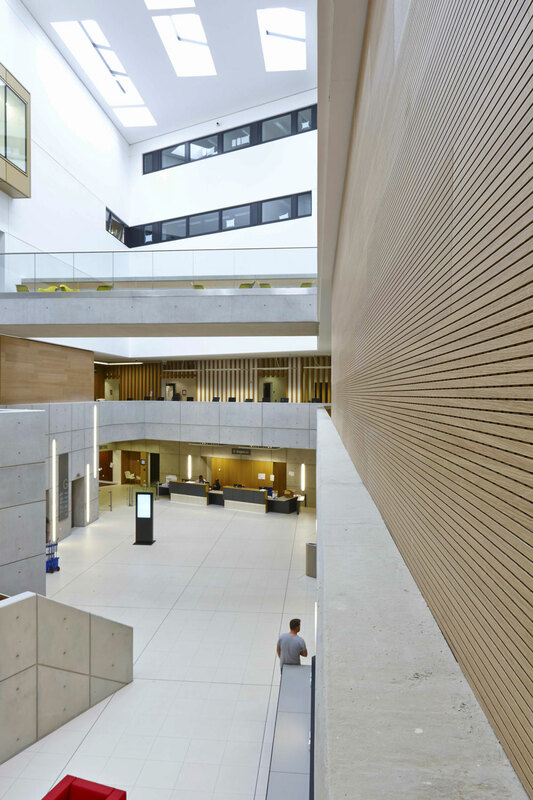 Extensive use of acoustic wooden posts been used as decorative features on the first floor self-study landing areas that open out onto the atrium.